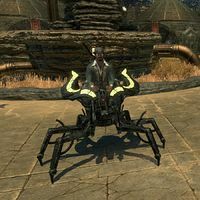 Though most ancient Dwemer automata are constructed primarily of the so-called Dwarven Metal, some rare and special animunculus mounts use a preponderance of Ebony. Creations like the Ebon Dwarven Horse are especially durable. Ebon Dwarven Horse is an upcoming mount. Its default name is "Metalmane". Ebon Dwarven Wolf is an upcoming mount. Its default name is "Blackwolf". Though Dwarven Metal was usually employed in building Spider constructs, for reasons unknown some rare variants were built with a darker Ebon Steel alloy. When found in working order, these automata are prized by collectors. The Ebon Steel Dwarven Spider was available for a limited time in the Crown Store for 036003,600 , exclusively to ESO Plus subscribers. It can rise up on its hind legs and turn on a red light. Its default name is "Darkwalker". Is this ghostly Elk an antlered mount from the spirit world, or is it a sending from Lord Hircine's Oblivion plane of the Hunting Grounds? It seems solid enough, and doesn't disappear in broad daylight, so it must be more than just a haunt! The Eerie Elk of Dread is an upcoming mount. Its default name is "Spook-Antlers". The many multicolored eggs of Tamriel are valuable for their differing alchemical properties, and this makes the Egg Hunter's job a profitable one, especially in the spring. Egg Hunter's Horse will be available in the Crown Store from April 18th through April 25th, 2019. Players riding the Egg Hunter's Horse carry a festive egg basket while mounted. The Mara's Spring Chicken pet, coming as a daily reward during the month of April, pairs nicely with this mount. Its default name is "Dobbin". This page was last modified on 3 April 2019, at 19:10.